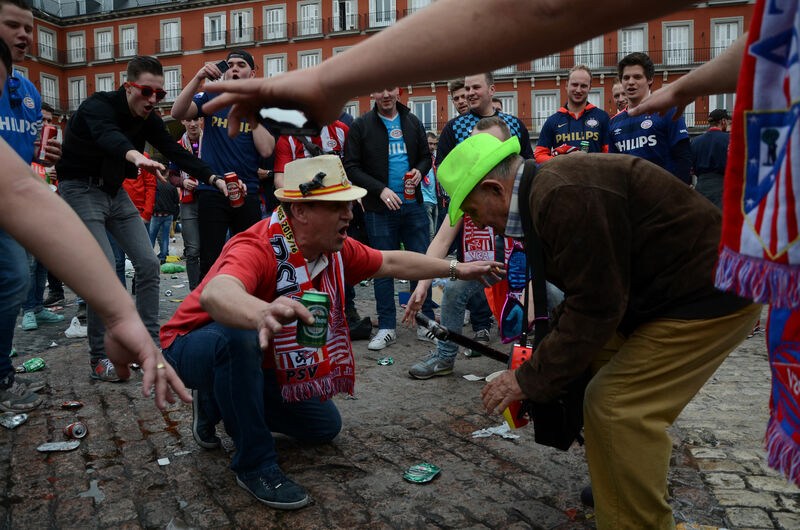 Sports minister Edith Schippers on Friday weighed into the row about the way a group of PSV fans humiliated beggars in Madrid ahead of a key football match, saying she found their actions ‘too disgusting for words’. Foreign minister Bert Koenders said the fans’ actions embarassed him as a Dutchman. ‘This is so humiliating as to be incomprehensible,’ the minister is quoted as saying. Justice minister Ard van de Steur declined to comment because of the official investigation under way in Spain. Video footage of the incident showed a group of PSV supporters throwing money at Romanian beggars in Madrid’s Plaza Mayor. The footage, shot by cub reporters at El País newspaper, shows PSV supporters demanding the women get down on their knees and do push-ups in exchange for the coins. Teacher Ángel Rendón, who witnessed the scene with some of his pupils, said the women ‘were treated like animals’. ‘They were fighting over the money while the Dutch were laughing,’ he said. PSV director Toon Gerbrands described the fans’ behaviour as ‘scandalous’. ‘The actions of a few individuals are damaging the reputation of the whole group,’ he said.